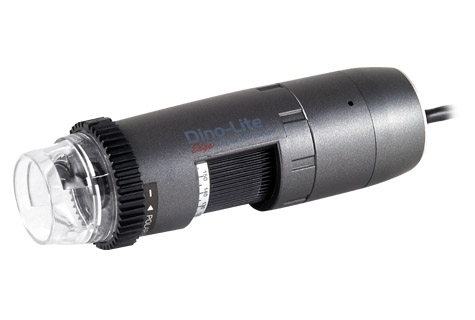 The Dino-Lite® AM4115ZTL Edge series handheld microscope features improved optics for sharper images, an adjustable polarizing filter, and a long working distance. With its polarizer feature, this model is especially well suited for applications involving highly reflective or translucent materials, such as electronics repair, LCD quality inspection, or jewelry fabrication. The AM4115ZTL includes our standard MicroTouch shutter button for quick and convenient picture taking, while the built-in bright white LEDs fully illuminate the viewing subject. 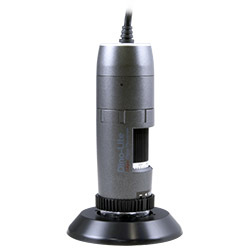 The specialized software bundled with this product allows users to calibrate the microscope, capture & annotate images, measure image features, and record video.